Who says Diabetes patients can’t enjoy a nutritious and sweet drink? With DiabetaMil, Diabetes patients will worry-no more as they can enjoy a delicious drink without the guilt of taking something sweet that can lead their sugar-level to rise. DiabetaMil is a specifically formulated as a complete and balanced-nutrition. Besides its great taste, it is enriched with Chromium Picolinate and Fiber. Being absorbed slowly in the body and having a controlled calorie formula, it is a perfect meal replacement suitable for diabetes. DiabetaMil Nutritious Vanilla Cereal Drink – Sweet vanilla cereal drink, perfect to take for breakfast. DiabetaMil Nutritious Vanilla Cereal Drink is packed with vitamin and mineral, cereal flakes, vanilla flavor with controlled calorie and no-sugar added. It is suggested to take 2 sachets per serving in a 200ml glass of warm water. DiabetaMil Nutritious Mochaccino Drink – a high fiber, non-cereal drink with delicious mochaccino flavor. Packed with vitamin and mineral, milk powder, mochaccino flavor with controlled calorie and no-sugar added, it is also suggested to take 2 sachets per serving in a 200ml glass of warm water. DiabetaMil Nutritious Cookies – enjoy these chocolate-flavored cookies like no other with DiabetaMil Nutritious Cookies. With controlled calorie and sugar-free, it is a perfect breakfast or snack. Each pack contains 2 pieces of DiabetaMil Nutritious Cookies. Chromium – an essential mineral required for normal glucose metabolism. It helps in increasing insulin sensitivity and controlling blood sugar level. Dietary Fiber – increases satiety and maintains healthy digestive system. Low Glycemic Index (GI) – food with a low GI value are those which are slowly digested and absorbed and thus will help maintaining a steady blood sugar level. DiabetaMil is endorsed by Mr. Pure Energy, Gary Valenciano (check out Gary V for DiabetaMil). It is available in leading supermarkets and drugstores nationwide. Be sure to consult your doctor first to help you for your eating plan. Name at least 2 of your favorite Gary V’s songs. In the comment section below, write your full name and your answers. Subscribing via Google Friend Connect (GFC) is a plus. Write down your GFC name also on your comment when you subscribe. This giveaway will run from July 8 to July 31, 2015. 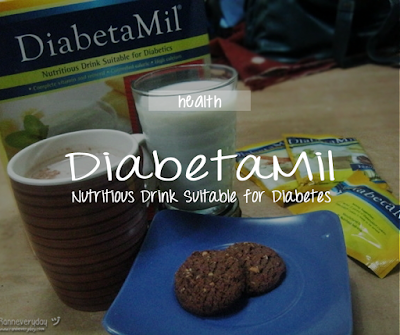 One random and lucky winner will win a DiabetaMil gift pack, delivered to his/her home.